B O O T L E A D: Countdown for the final confrontation. Countdown for the final confrontation. On December 23 the Telegraph (UK) published an article by Ambrose Evans-Pritchard with the headline, “Crisis may make 1929 look like a ‘walk in the park.’ The article begins, “Twenty billion dollars here, $20 billion there…. Buckets of liquidity are being splashed over the North Atlantic banking system, so far with meager or fleeting effects.” Large banks are in trouble. Huge sums of money are disappearing. The capitalist system is faltering. At the same time, the “former” center of global communism is brimming with new confidence. Russia is deploying warships to the Eastern Mediterranean, building and testing new intercontinental missiles and submarines. The rhetoric of Russia’s president, Vladimir Putin, has a “neo-Soviet” ring to it. When visiting Cuba a few years back, a journalist asked Putin about his ideological loyalties. Was he a communist? “Call me a pot,” he said cryptically, “but heat me not.” Like Stalin after the New Economic Policy of the 1920s, Putin has nationalized major Russian industries. He has curtailed press freedom. 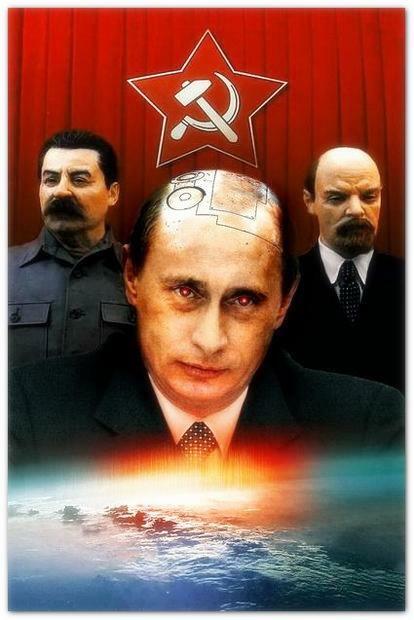 He has reversed the process that dismantled the Soviet Union. He is taking up the pieces of the old communist empire, and putting them back into place. Vladimir Putin knows that defeat may be a temporary expedient. A broken nation can bounce back. The tables can be turned on old enemies who believe they’ve won. He knows, as well, that history is cyclical; that peace leads to war and boom leads to bust. While Western businessmen and politicians have implicitly denied (in their rhetoric) the inevitability of war and financial catastrophe, there is a longstanding political movement firmly based on the expectation of both. I am referring to the political movement founded by Karl Marx and continued by Lenin, which has existed in many countries under various names and guises. Marx taught his followers to expect a future financial crash. This crash, said Marx, would discredit capitalism and open the door to global revolution. After Marx came Lenin, who taught that a future “imperialist war” would contribute to the destabilization of capitalism, discredit the leadership of the developed countries, and enable a worldwide workers’ revolution. The shrewdness of Marx and Lenin may be found in their prediction of what was always inevitable, making themselves appear more authoritative than other would-be revolutionaries. Marx and Lenin have followers throughout the world. And these followers are organized. They also have Islamic imitators. The specifics of doctrine are unimportant when studying totalitarian countries. What matters is the ever-present hatred of Western civilization, mass-murder, oppression, and an obsession with destructive war. These are the common elements. These are the tags that give away the game and tell the observer what he is looking at. The Islamist and the Communist seek to undermine the West economically, socially, demographically and politically. The military balance also plays into their calculations. This is why the acquisition of nuclear weapons by communist and Islamist countries is a top priority. The policies of Hugo Chavez, Vladimir Putin, the Chinese communists and the clerical regime in Iran are all coordinated at the highest levels. Economic warfare is also a consideration, especially when it comes to oil and currency manipulation. It is in this context we should consider the statements of leading economists and financial experts today. We are told that financial dominoes are tilting. If the fear of widespread bankruptcy cannot be contained, if banks and hedge funds are about to collapse, if lenders are hoarding cash and borrowers suffering the pangs of unsatisfied addiction, if the money screw has become a thumbscrew and the tortured victim is forced to yell out his bankruptcy, then the Marxist party is about to see the fulfillment of the old prophecies and promises. The expected revolution is about to come. It will come on the heels of capitalism’s crisis. In the Telegraph article Evans-Pritchard quotes Professor Peter Spencer as saying, “The central banks are rapidly losing control.” He also quotes British and American experts who agree that “the crisis” has moved beyond collapsing mortgage securities and now threatens the entire financial system. On Dec. 12 the Wall Street Journal ran a piece titled, “Banks Sound Grim Notes.” According to this article, some of the “biggest U.S. commercial banks” have been issuing warnings that “underlying business fundamentals are continuing to deteriorate.” Many banks are predicting that 2008 will be a year of “mounting loan defaults” and heavy losses on all sides. Last month, Merrill Lynch advised investors to stay away from Bank of America and J.P. Morgan. The great economists taught us what to expect from irresponsible credit expansion. But when the generation that experienced the Great Depression had passed from power, the rising generation did not believe a Great Depression could happen to them. Turning their back on history, they imagined themselves superior to those who came before. The great sociologists and historians taught us that the mistakes of previous generations would be made again and again, despite warnings from the wise. And so they are proved right. We are human, and we are fated to err. The boomer generation is not immune to the laws of economics. Furthermore, the “end of history” did not occur, as alleged by Francis Fukuyama. Even now, at this very moment, we are up to our necks in history. Ours is not a “more perfect world” than our forefathers. The world is still the same world, with the same problems as before. If our grandparents had to contend with Hitler and Imperial Japan, we must contend with Putin and the Chinese communists. Last month Russia successfully test-fired a multiple-warhead road-mobile ICBM. It is a type of weapon the United States doesn’t have and doesn’t plan to develop. The RS-24 can carry up to three warheads, using technology from the advanced Topol-M system (already deployed). As a mobile platform the RS-24 can hide almost anywhere, so the United States cannot determine if it is falling behind in a new arms race. The Russian navy has also test-fired a new submarine launched ballistic missile called the Sineva. Those who laugh at Russia’s meager economy will be baffled by the regeneration of Russia’s armed forces, based as they are on a strategy of “leveling the playing field” (literally) with missiles. The year 2008 will clarify the position of the United States as a great power in relation to the emerging power of China and the supposedly defunct power of Russia. If the financial crisis worsens (as it is likely to do), a political crisis is bound to follow. Few dare talk about this crisis (even now), although communists have been discussing it for many decades. Mainly, they have been considering how they will exploit a major economic crisis. With the Western intelligentsia sunk in the mire of political correctness, and the stupefaction of a television-besotted public, they are the only party on Earth that is psychologically ready with answers and slogans. Their political powder is dry, and they are well stocked. There is every reason to believe that the public will be confused, that the politicians will be knocked off balance. The year 2008 may be a year of decision, not because it is a presidential election year, but because the West may be shaken to its foundations.